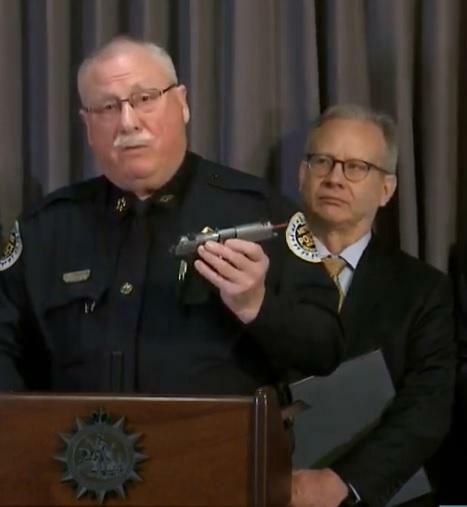 During a press event Jan. 31, Nashville Chief of Police Steve Anderson explains how Project Safe Nashville can help reduce gun crime using a weapon seized during a recent arrest. Nashville residents dialed 911 to report gun related incidents more than 6400 times last year. The city suffered 85 murders in 2018 alone, most committed with handguns and the majority involving young men. Project Safe involves a seven-officer police unit working with the city’s crime lab. The partnership also involves state and federal prosecutors along with the FBI, TBI and the ATF. A video prepared by the city explains how the Crime Lab analyzes shell casings gathered at crime scenes, and guns seized during arrests. With gun in hand, Nashville Police Chief Steve Anderson explained how testing just one seized weapon can help solve several crimes. Mayor Briley stressed the new effort is budget-neutral. Project Safe Nashville uses existing personnel and a $319,000 Department of Justice grant.